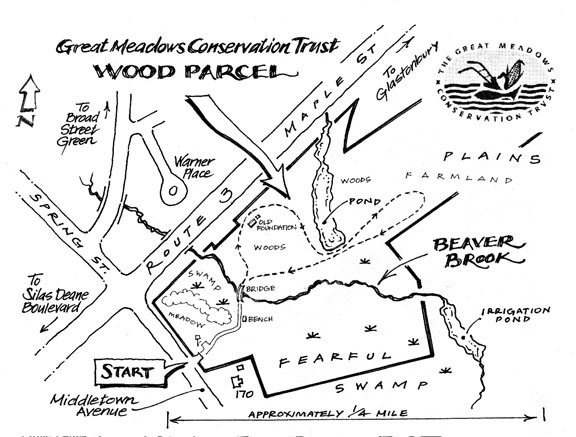 The Great Meadows Conservation Trust, Inc., preserves parcels by ownership or by easement. As of 2007 we own 46 parcels for a total of 172 acres, and we hold conservation easements on 3 parcels for a total of 15 acres. The parcels we own are generally open to the public from dawn to dusk. In some cases we may close a parcel if needed to protect environmental resources. We manage the parcels we own to protect and enhance natural resources. In February, 2005, the Board of Directors approved a revised Land Management Plan which tells about our management policies. Click here to read our Land Management Plan (in pdf format). Most of our parcels are located in the meadows among parcels of many other owners. They are hard to find without guidance. Our winter walks visit many of our parcels. 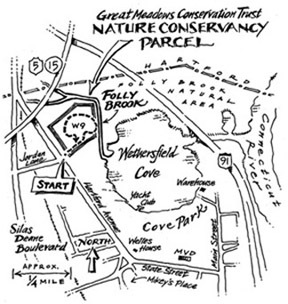 Two of our parcels, the Eleanor Buck Wolf Parcel and the Wood Parcel, are a few steps from the village of Old Wethersfield. Eleanor Buck Wolf worked tirelessly to protect and preserve the Great Meadows for future generations. This parcel, named in her memory, is a remnant of the Buck family farm that extended from the shore of the cove up both sides of Jordan Lane. Farmed by the Buck family for generations, the parcel was donated to The Nature Conservancy to be preserved in perpetuity, by Francis Goodwin, III. The Nature Conservancy in turn gave the land to the Great Meadows Conservation Trust. It would revert to The Nature Conservancy if the Trust ceased to exist. The Wolf parcel, easily accessible from Hartford Avenue in Wethersfield, affords views from the North side of the Wethersfield Cove. 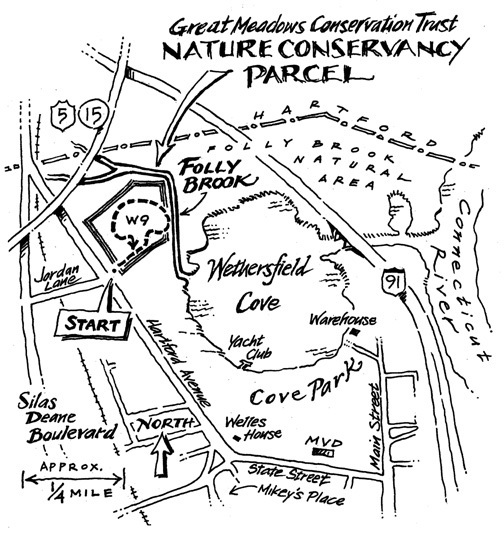 The fourteen acres of meadows, marsh and wooded flood plain extend along the shore of the Cove and Folly Brook. Great Blue Heron, Kingfisher, ducks, river otter and many other species inhabit the area. Annual walks every winter introduce the public to the sights, and to our plan to control the encroaching forest, and restore and maintain the meadow and marsh habitat. A draft of a study by naturalist William Neiring of the flood plain forest habitat in this area with data from 1961 can be found here. The Wood parcel is accessible from Middletown Avenue in Old Wethersfield, and affords views of Beaver Brook, the marsh of "fearful swamp," and six acres of sweet corn grown by Anderson Farms. Click here for map. The property was acquired from a family that had used it for several generations. The purchase price was partially reimbursed by a DEP Open Spaces grant. An 18th Century home stood on the site until the construction of Route 3. Walks are held here every winter. The Trust has been actively managing the parcel to control invasive species. 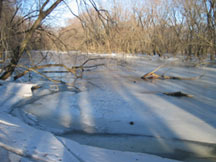 The Town has engineered a proposal to improve the stream channel as it flows through the parcel which, when completed, will enable public access to views of the marsh and brook, as well as clear debris. The other parcels we protect are conservation easements. A conservation easement allows the donor to continue to own and use the parcel as he or she wishes. It puts a series of restrictions on what cannot be done with the parcel. No buildings are allowed, and other restrictions are imposed depending on what resources are being protected. The restrictions are passed down to future owners of the parcel. The Trust’s role is to monitor the parcel and ensure that none of the restrictions in the easement document are being violated. The Trust will enforce the restrictions if they are not followed. Since the land continues to be privately owned, these parcels are not open to the general public, unless the easement allows it. Some of our easements are visited on the winter walks. 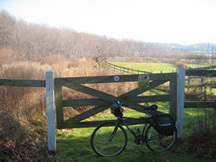 Great Meadows Conservation Trust, Inc.